Hei, aurinkoista syystorstaita! Kaunista viikonloppua luvattu, hyvät veneilykelit myös. Minä ajattelin polkaista katsomaan löytyykö puolukoita tai sieniä. Hi, it's sunny thursday, promised to be warm weekend. I don't go sailing as this little boy, I'm going to see if there's any mushrooms or berries left in the wood. 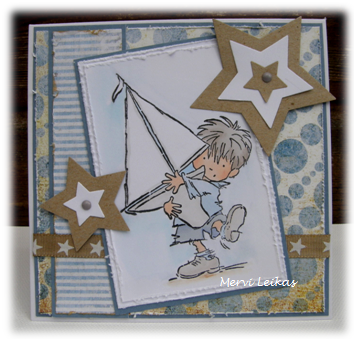 Sizzix stars, brads, star ribbon. Alkukesän kanttarellisadon päällä lötkötteli iso sammakko. This summer's first chantarelles with a frog on. Slowly he moved away. Kauniit värit ja kiva tunnelma. One of my favorite LOTV images and I just become the lucky owner of one, I'm so looking forward to ink it up. Your masculine card is so well designed both color and detail wise. Ihana kortti ja upea valokuva. Ohhhh! This is a gorgeous image and so wonderfully romantic colours! Thank you so much for joing our challenge at ATSM with your beautiful card this week. Beautiful card! Such a sweet image and wonderful design!